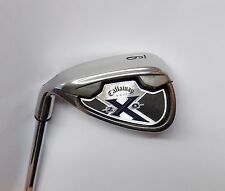 Left Handed Callaway X20 9 Iron. Grip: callaway lamkin z5. Model: rogue cf87 iron. We specialise in the sale of affordable new golf balls and lake golf balls. Other deals available include a wide range of clearance apparel, footwear and accessories. Callaway Big Bertha X-12. Pitching Wedge. Left Handed. Flex: uniflex. Model: big bertha 50 degree wedge. Grip: callaway big bertha. We specialise in the sale of affordable new golf balls and lake golf balls. Other deals available include a wide range of clearance apparel, footwear and accessories. Left Hand Callaway Steelhead X16 #4 Iron. Left hand Callaway Steelhead X16. #4 iron. Fitted with Callaway Constant Weight Ultra Light regular steel shaft. Original grip. Very nice condition. Callaway Big Bertha Uniflex Steel Shaft. 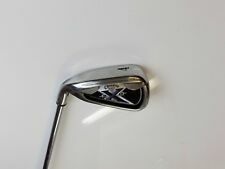 Callaway Big Bertha 08 I-Brid 4 Iron (Left Handed). Standard Lie Angle. Shaft - 7 out of 10. Showing light marking standard wear and tear only. The shaft sticker is missing. Left-Handed Callaway X2 Hot Pitching Wedge. Left Handed Callaway X-HOT 6 Iron. Left Handed Callaway Big Bertha 7 Iron. Lincs Golf. Callaway Diablo Uniflex (Regular) Steel Shaft. Callaway Diablo Edge Left Handed 5 Iron. Original Callaway grip. Standard Length and Standard Lie Angle. Shaft - 8 out of 10. As you would expect for a steel shaft. MODEL:BIG BERTHA. SHAFT:BIG BERTHA. GRIP: CALLAWAY. IRON: #6 IRON. MATERIAL: STEEL. Left Handed Callaway X-HOT. Lincs Golf. Left Handed Callaway Big Bertha 5 Iron. Pitching Wedge. Left Handed Callaway X Series 416. Lincs Golf. Left Handed Callaway X Tour Forged 9 Iron. Lincs Golf. Left Handed Callaway Steelhead X14. Sand Wedge. Lincs Golf. LEFT HANDED CALLAWAY GOLF DIABLO EDGE No.5 IRON ONLY. LENGTH: 99. USED CALLAWAY TOUR X WEDGE. LEFT HANDED. GOLF PRIDE TOUR VELVET GRIP. 52' / 11' BOUNCE. PART OF OUR TRADE CLEAROUT. Left-Handed Callaway X2 Hot 8 Iron. Callaway Golf X Hot N14 Pitching wedge in good overall used condition. Callaway Golf X Hot uniflex steel shaft, minor pitting as shown. Callaway Golf grip in good condition. All pictures are of the actual club for sale. Left Handed Callaway X Series 416. Lincs Golf. Left Handed Callaway X Hot 5 Iron. Callaway Razr XF Black #6 Iron. LEFT HANDED. Grip: Golf Pride Patriot. (All photos are of the actual club being sold). Get in Touch. 'Pured' Shaft. Length: Standard. Club Length: 37.5". Left Handed Callaway Diablo Edge 6 Iron. Left Handed Callaway Steelhead x14 4 Iron. Left Hand Callaway X12. #5 Iron. Left Hand Callaway X12. #5 Iron. Fitted with Memphis 10 regular steel shaft. Original grip. Great club in very good condition. FITTED WITH A CALLAWAY UNIFLEX STEEL SHAFT . Left Handed Callaway Big Bertha. Sand Wedge. Lincs Golf.